Last Saturday, September 7, was the first 6 am Penn State game (in Hawaii, of course) and Bryce's Mom Teresa was less than interested in joining us for breakfast, bloody mary's, and football viewing at the bar. (Click here if you missed her first day in town.) 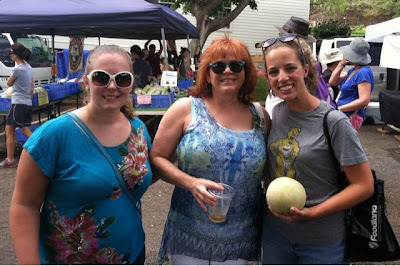 After the Nittany Lions CRUSHED the Eastern Michigan Eagles, Cassie, Teresa, and I journeyed to the KCC Farmer's Market. WOO - canteloupes! 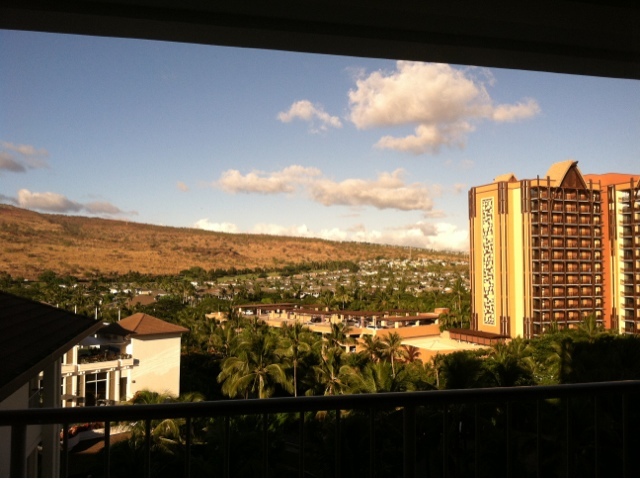 My Aunt Slynn (Sally + Lynn) and her friend Patty arrived on Oahu and we met them at the hotel where we'd all stay throughout the week. They were the first ones to check in! 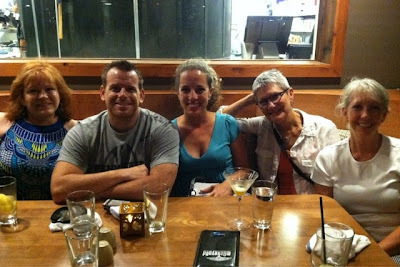 Right across the street from the resort is a restaurant that Cassie has been raving about for months - Monkeypod Kitchen. Bryce and I, Teresa, and Slynn and Patty enjoyed a great dinner and plenty of desserts! 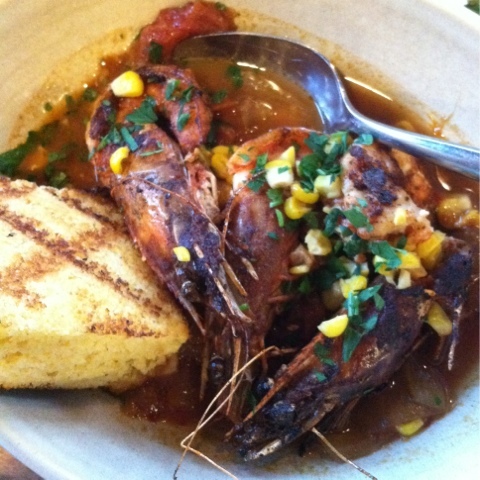 We shared our selections, although Slynn did most of the hunting and gathering on these shrimp. They're the Spicy Seared Whole Kauai Shrimp with Hau'ula Tomato Gumbo and Grilled Upcountry Cornbread. If there's any item that I'm continuing to dream about it's these pumpkin ravioli with homemade pasta. 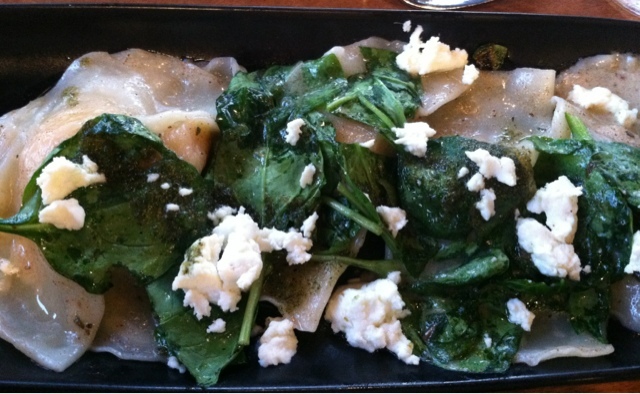 More specifically the Pumpkin Patch Ravioli Kiawe-roasted Squash, Chevre, Spinach, Sage Brown Butter. The pasta was so delicate and delicious and the pumpkin filling was excellent. Plus - chevre cheese! I don't know how to say it, but I know I love it. Patty opted for the Portugese bean soup and oven charred brussels sprouts. 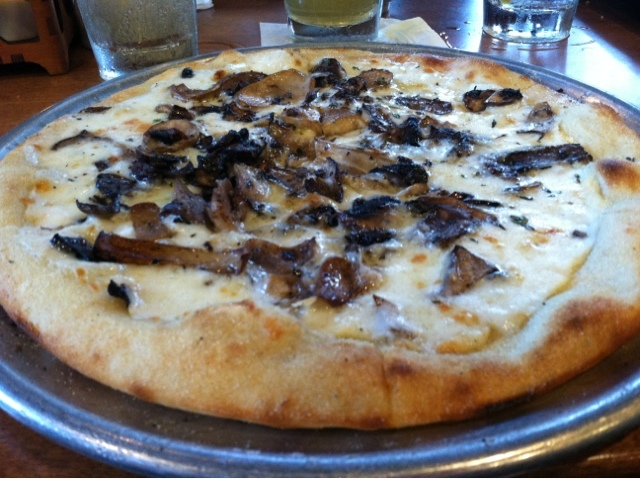 My choice was the pizza with (local) Hamakua Wild Mushrooms, White Sauce, Truffle Oil, Parmesan Cheese, and Thyme. I can't say enough about how rich and delicious this pizza was! My absolute favorite is mushroom and black olive pizza and that's the only thing that could make this pie even better. 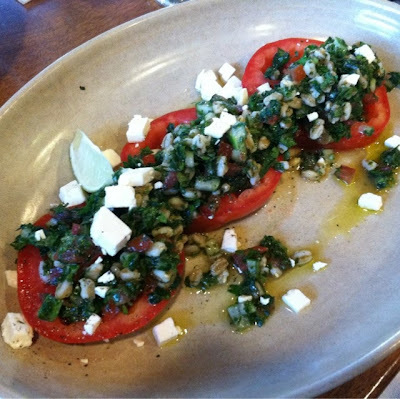 My semi-healthy choice was the Tabouleh with Hau'ula Farm Organic Tomato made with Whole Grain Farro, Ricotta Salata Cheese, Cucumber, Mint, and Parsley. It was the best, BEST tabouleh I've ever had! 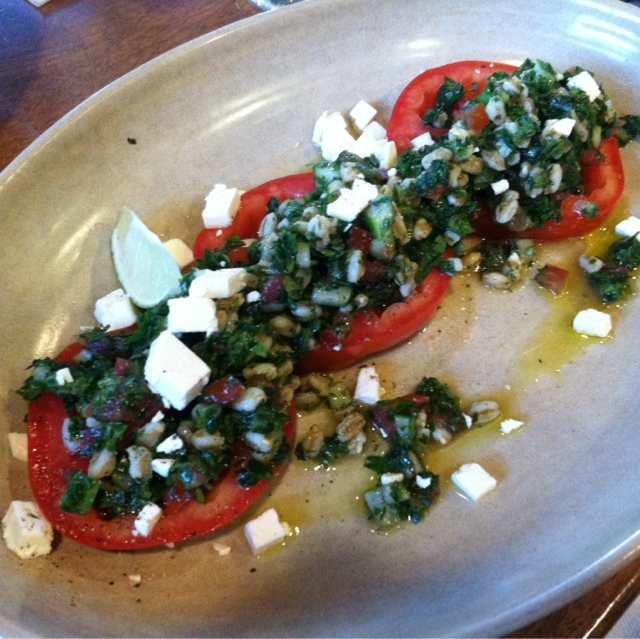 The flavors were so fresh and serving it on tomato was something I'd never before experienced. OHHHHHHHHH and the dessert!!! 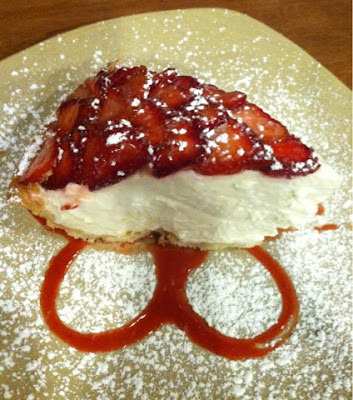 This was some type of strawberry guava cream pie and it was delectable! We did the usual "Oh I couldn't eat other bite" routine before attacking this large slice of pie with clanking dessert spoons. This was just the start of the wedding fun and I manage to made it back to Monkey Pod Kitchen 2 more times last week! Just call me... Bridezilla.